Location: Home > Computers > Multimedia > Video Cards > Cables To Go TruLink 2-Port UXGA Monitor Switcher/Extender with Audio - 2-Two VGA Inputs, 1-One VGA Output, Audio, Remote Control, 2048x1536, Signal Enhancement, 450MHz Max. Cables To Go TruLink 2-Port UXGA Monitor Switcher/Extender with Audio - 2-Two VGA Inputs, 1-One VGA Output, Audio, Remote Control, 2048x1536, Signal Enhancement, 450MHz Max. Great product and value. Easy to set up and use. Does a great job! Well worth the purchase. I would say this Switcher-Extender is a great device, it does exactly what I need it to o, and it's simple and intuitive. It's handy, and well designed. Haven't had any problems with it yet. The TruLink? 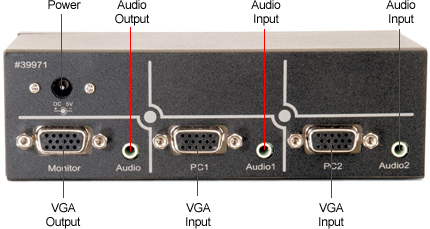 video switcher/extender with audio is able to broadcast the video and audio outputs from two computers to one monitor/projector and speaker set. Daisy-chain more than one switcher to expand the number of computers you can connect. With the built-in video signal enhancement, you can place the monitor up to 210 feet away while maintaining your video quality. No software is required and PC selection is easy. 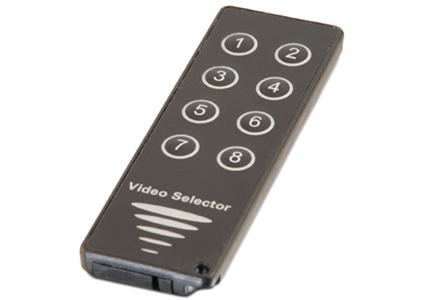 Switch between computers via push buttons or use the infrared remote control for PC selection from up to 6 feet away. 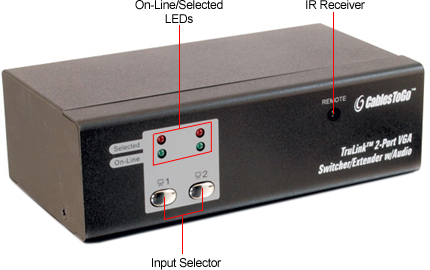 From use in test bench facilities, data centers and help desks, classrooms, and multi-media centers, the TruLink video switcher/extender with audio delivers both performance and value.